Prepare a baking dish with cooking spray. Set aside. Wash and bake sweet potatoes whole. Allow to cool enough to handle and remove skins. Place the sweet potato into a large bowl and add the brown sugar and vegan margarine. Using a potato masher, roughly mash until butter melts. 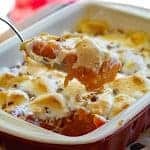 Fold in the salt and vanilla and spread into your prepared casserole dish. Top with VEGAN marshmallows (I use Dandies brand). You could use mini's, but since I had the traditional size, just cut them in half lengthwise. Place over the top of your mashed potatoes. Top with a sprinkling of chopped pecans and bake until the marshmallows are melted and golden. I rotated mine between the middle and top rack in the oven until I got the color I was seeking. This should take about 20-30 minutes. Allow to cool slightly before serving. Those marshmallows are HOT!